A professional quality resume template that will be a good fit for most industries, style 16 has a high-end layout for your name and contact details. The bordering lines around your name focus the readers attention to that area. And having your contact information directly below puts everything right there. Your addresses and phone numbers are arranged in two columns. The rest of the layout is pretty standard except for the section headings employing overlines instead of the usual underlines. Style number sixteen can be a nice change if you are looking for something different. From the example image you can see the basic layout, if you don't want it arranged that way you can easily change it with the click of your mouse or tap of your finger depending upon the device you are using. You can build your resume or other documents we provide with a desktop computer, a tablet or a smartphone. When you are building your resume consult our tutorials and helpful tips, and always use the spell checker. A surefire way to make yourself appear to be inept is to improperly spell your words, they are such simple and unnecessary mistakes to make. With all the resources available on the internet, for almost anything, there really is no excuse to write poorly. Take some time to make sure as best you can to verify that you use proper grammar, punctuation and sentence structure. Obviously we can't teach you four years of English Comp in the time it takes to use our Free Resume Creator, but you can consult our guides on resume grammar errors. As long as you don't make the most obvious mistakes you will probably be all right. All we can do is work with what we have and do the best job we can. Do some research on the company you are applying to, and if you can find out who the person is you are applying to all the better. If you appear to be knowledgeable about the company and the person you will work under, it will show that you are a person who goes above and beyond to get what they want. Employers like that as it shows that you are a person who gets things done. Sometimes all it takes is one little asset on your part to tip the scales of indecision in your favor, to decide between you and another applicant. In other words, make yourself stand out! You should always do that not just when trying to get a job. 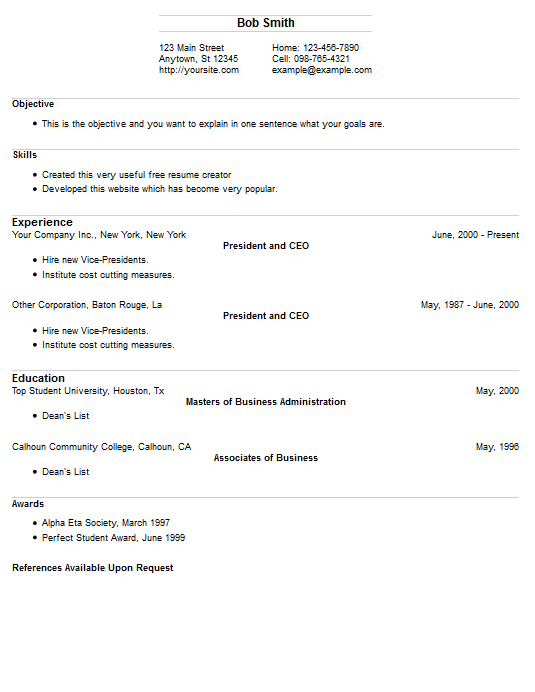 Export this template from our resume builder.